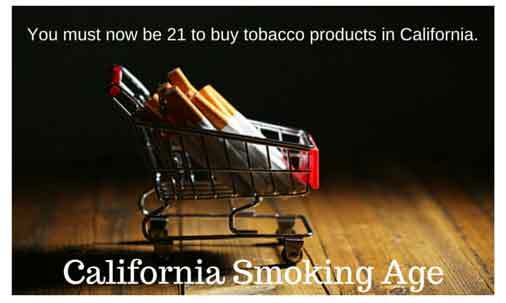 You may have seen the warnings in the grocery stores lately leading up to today when a new California law raised the smoking age from 18 to 21. So, you must now be 21 in California to buy tobacco products. Along with the smoking age law, an additional law in California bans e-cigarettes from public places such as schools, restaurants and hospitals. Reclassifying vapor products, even if they contain no tobacco and treating them the same as combustible cigarettes “opens the door to excessive taxation that will economically penalize smokers looking to make the switch to vaping,” said Josh Krane, president of the California chapters of the Smoke Free Alternatives Trade Association. According to a 2016 federal Institute of Medicine study’s research "concluded that increasing the minimum age to 21 would result in 200,000 fewer premature deaths for those born between the years 2000 and 2019." It would lead to a 12% drop in smokers. Studies show that disease from tobacco use is a major driver of healthcare costs “with upward of $3.5 billion annually in Medi-Cal costs, and as much as $18 billion to the overall health care system” which drives up costs for all individual health care consumers. There are provisions in the law that allows underage military personnel to remain purchasing cigarettes. As predicted, opposition to the smoking age change has come from big tobacco companies who are actively seeking to overturn it through a referendum vote.